Friday, Mar. 18, 2019 - An interfaith Prayer vigil was held at Surrey Holland park to remember the victims of the New Zealand Mosque Shootings. Sikandar Hayat organized the interfaith event as a way to promote dialogue and understanding of each other saying,"We call out to everyone to help end violence, especially when it threatens the lives of children, We must continue to speak up in the face of rising intolerance and hatred – by making it clear that we will conquer hate with compassion, love, understanding and justice," he said. “By educating children and young people about extremism, Islam and other faiths with strong curricula based on current research findings, we can move forward." He further stated "We overwhelmingly reject the politics of racism and exclusion, and standing together, we are committed to building a diverse, inclusive and welcoming society that promotes respect for all, regardless of faith, race or ethnicity." 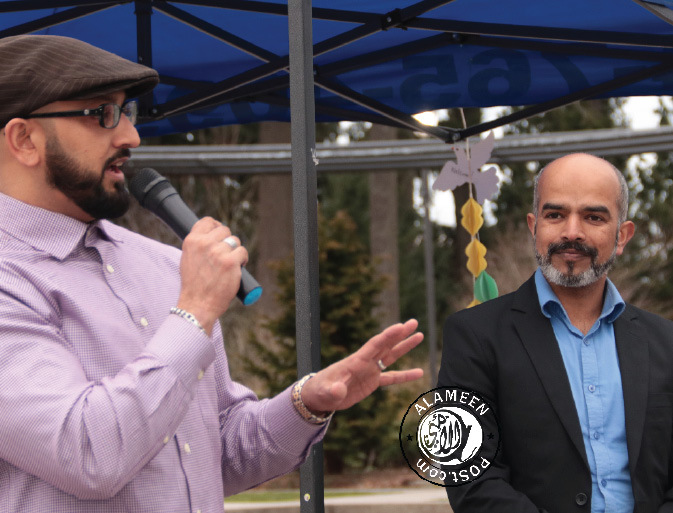 Notable guests who spoke at the event included Mp Sukh Dhaliwal, Maualana Naumani, Harpreet Singh and Dave Hayer. As a foundation advocating for children everywhere, The Amazing Tutors Children’s Foundation condemns violence against children and their families regardless of the form it takes. The children at the Christchurch Mosque attended with their families to pray and worship. A threat to their lives should raise concerns for everyone about religiously motivated violence. These innocent lives must be protected, for within them are the seeds of the world we want to build. If we hope to create a society of tolerance, freedom and compassion, then we must secure the safety of all children and their families regardless of race, religion, or gender. Like all the houses of worship, mosques are sanctuaries for peace and spiritual development. Violence against them will only continue the cycle of intolerance and hate that divides us as a people. There is no greater violation. By standing together in condemnation against violence, we can help break the cycle, and create communities of understanding, caring and compassion. The children attended prayers with their families, making the mosque populated while the attack ensued. The timing of this attack only raises concerns about intolerance and violence within our communities. At a time when communication and diplomacy are needed more than ever, acts such as this only exacerbate and inflate tensions between religious communities here in Canada. If we hope to create greater understanding between people, we must take steps to end the cycle of violence that fosters intolerance and hatred. “We call out to everyone to help end violence, especially when it threatens the lives of children. As a community, we should strive to create a space for children and their families to live that is safe, tolerant, and compassionate. Acts of violence threaten us all, even when directed at specific groups,” advocate Sikandar Hayat, director of the Amazing Tutors Children’s Foundation. “We must continue to speak up in the face of rising intolerance and hatred –by making it clear that we will conquer hate with compassion, love, understanding and justice. One way to reduce acts of violence and crimes committed against humanity is to take away guns and to pursue a long term strategy which instills in young people the desire to act wisely. By educating children and young people about extremism, Islam and other faiths with strong curricula based on current research findings, we can move forward. The fruits of this type of educational program can be a caring and giving community made up of compassionate, forgiving, respectful, and tolerant and citizens.